I've enjoyed Mike's reaction to the "big" prints I made for him. It's always nice to produce something which generates such a sense of delight, and this was no exception. To carry the experiment one step further, I thought I'd write up my response to what Mike has written, and offer my meager insight into the whole "big print" thing. I’m not surprised Mike says that it’s hard to look at the small prints because your attention is drawn to the large prints. That’s definitely true—large prints are an attention grabber in a big way. Now, that can be good, or bad. If the photograph isn’t any good, then it might be true that a really big print of this cruddy photo looks better than a little print, but you’re still trying to make a silk purse from a sow's ear. Printing it bigger doesn't magically transform it into a good photograph; it just makes it looks slightly less lousy. And some photographs are meant to be a small, intimate viewing experience. As much as I love the photographs in Michael Kenna's Monique’s Kindergarten, I think most of them would lose their appeal when printed larger. I think Mike is right to be delighted with the way this image comes across printed large. It has that hard-to-pin-down set of qualities that make it a good candidate for being printed large—some sharp detail, some areas of nice, luscious creamy tone. That's why I sent the email to Mike proposing this experiment in the first place—I had a pretty strong feeling that this print would be a winner printed large, and the real question was just how large we could print an image from a 6-megapixel camera and not have it look worse instead of better. We both got a real surprise on that score—before printing it, I would have bet that the best looking print would actually be pretty small. If you had asked me beforehand if I thought you could print an image from a 6mp camera at 22x33 and have it not look like crud, I would have told you "No way." But after I made that 22x33 print I sent to Mike, I sat down, looked at it, and concluded that I was just plain wrong. I'm not saying that every image from a 6mp camera can be printed 22x33 and look good; I'm just saying that this one can. Finally, there are some practical issues to large prints; it’s not all sweetness and light. They're hard to handle—a 44x55-inch sheet of paper gets kinked just laying flat on a table. 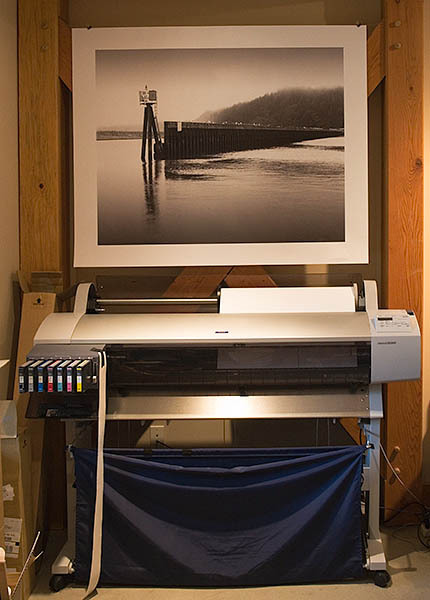 They're hard to present—a 22x 33-inch print is about the largest 2:3 aspect ratio print you can overmat with 32x40 mat board, the largest easily available size. Finally, unless you happen to live in a museum, you probably don't have very many places where you have enough wall space to display very many large prints. But a large print of the right image (and "Surface Tension" is a good example) can be a thing of beauty and a joy forever. "If you can't make it Good, make it Big," is a old, well established truism in the Artsy Industry. Well, except that the artsy isn't an industry. It's one of the few things left that isn't. There are many qualities of photographic images that appeal to me. Most of them are identical to qualities that appeal to me in paintings. But one that is characteristic of certain kinds of photography is something I'll call “verisimilitude”. In other words, the two-dimensional image seems to be true to some three-dimensional world experience I have (or would like to have). How does this work? When I see something that appeals to me in the three-dimensional world where I live, it starts a process of exploration. I will stop and soak it in. But then I will move closer. I'll walk into the scene to get a better look. I will probably pick up something; touch something; stick my nose in it. It draws me in. Decades ago, I stumbled into a small exhibit of Eliot Porter landscapes. I was stunned. I was immediately drawn into his world of small New England ecologies. The prints were not large (perhaps 11” x 14”) but the strong graphic compositions were recognizable from across the room. I found myself compelled to walk closer; to stick my nose on the glass and soak in the detail. Many images work best large: near/far compositions, strong graphic compositions with textures, etc. I'm unsure about really large portraits. An 11x14 head shot is basically life-size. Can't get any more verisimilitudinous than that! There are plenty of photographers who make a living on being big-- Alec Soth, Joel Sternfeld, Robert Polidori, Candida Hofer, etc. I'm not knocking them-- many of their compositions are beautiful and work when printed small, but let's be honest-- the majority of them don't. Just because you have a 5x7 or 8x10 negative doesn't mean you have to go large. I'd rather linger at a Nicholas Nixon show rather than go to an exhibit of any of those photographers I just mentioned. I recently had the opportunity to spend an evening with Nicholas Nixon. Although he has exclusively made contact prints of his (large format) work he recently began toddling into enlargements. He brought some of his more recent work from the Boston "Big Dig' project enlarged to perhaps 24 x 36 and larger. They were positively breathtaking images at that size.